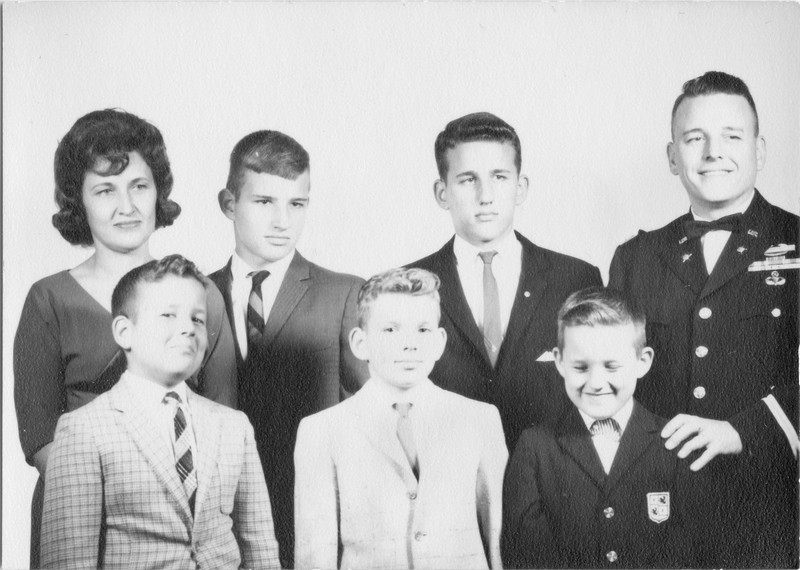 Lt. Col. Bernard W. Dibbert and his wife, Ann, and their five sons: front row from left, Charles, Michael and William; back row, from left, Bernard Jr. and Doug. The endowed fund will benefit dependents through the Carolina Covenant. When Army Maj. Bernard W. Dibbert deployed to Vietnam in 1965, he sent cassette tapes home to his wife, Ann, and five sons in Fayetteville. The Ranger and company commander with the 82nd Airborne Division at Fort Bragg had graduated from the University of Washington, where he had an ROTC scholarship, and on those recordings he spoke adamantly about his sons also getting a college education. All did, including four at UNC: Doug ’70, Michael ’74 (’76 MAT), Charles ’77 and William ’81 (’87 MSW). The fifth son, Bernard Jr., attended N.C. State University for its Army ROTC program, which UNC did not offer. 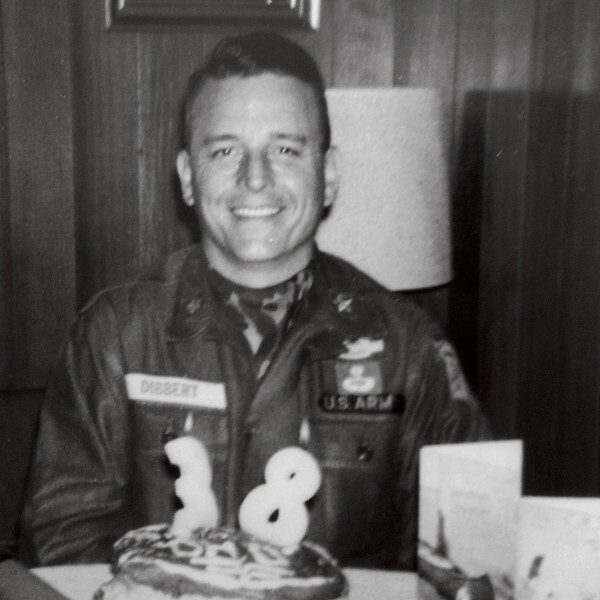 Maj. Bernard W. Dibbert celebrating his 38th birthday on March 23, 1965, shortly before deploying to Vietnam. But the 38-year-old veteran of World War II and the Korean War never got to see their achievement. He was killed in action on June 1, 1965. He also did not know his promotion to lieutenant colonel had been approved the previous day. Now the General Alumni Association is honoring the Army officer and his son Doug, president of the GAA, with a $2 million gift to UNC to provide scholarships for students from military families. The Lt. Col. Bernard W. Dibbert Carolina Covenant for Military Families Endowed Scholarship Fund will aid military-affiliated students eligible for the Carolina Covenant, which provides UNC students from low-income families the opportunity to graduate without loan debt. The gift also was made as part of UNC’s For All Kind: the Campaign for Carolina and its Red, White and Carolina Blue Challenge to support families of military veterans. Scholarship recipients will be recognized as Lt. Col. Bernard W. Dibbert Military Families Scholars. “With this monetary gift, we will provide access to UNC for many deserving students who are members of military families,” said L. Ferguson “Ferg” Norton ’61 of Wilmington, chair of the GAA Board of Directors and a retired Navy rear admiral who was in Navy ROTC at Carolina. The GAA’s Board of Directors approved the gift at its quarterly meeting in January, and the GAA announced it with the University today at the George Watts Hill Alumni Center. Tom Lambeth ’57, chair of the GAA’s Tar Heel Network that advocates on behalf of the University’s interests and a former GAA board chair, said that in recognizing the service of Lt. Col. Dibbert — whose military honors included the Silver Star, Bronze Star with Oak Leaf Cluster, Purple Heart with Oak Leaf Cluster and the Army Commendation Medal — the gift intends to honor the outstanding service and leadership of Doug Dibbert as chief executive officer of the association since 1982. Lambeth also noted how the scholarships would create a legacy informing future students of how they benefit from the sacrifice of those that preceded them. Dibbert said the gift fits perfectly with Carolina’s mission to make higher education broadly available. Among those attending the gift announcement with Dibbert were brother Michael T. Dibbert ’74 and his wife, Tricia Mills Dibbert ’75; brother Billy Dibbert ’81 and his wife, Jeanne Scott Dibbert ’87 (MSW), and their daughter, Ashley Dibbert, a senior at Carolina; wife, Debbie, assistant vice chancellor for principal and major gifts; son Michael S. Dibbert ’03, his wife, Carolyn Blake Dibbert, and their children, Cassidy, Jamison and Teddy; and son Brian C. Dibbert ’05. The scholarships will be administered by UNC’s Office of Scholarships and Student Aid. When fully funded, there will be up to 25 Dibbert Scholars on campus during each school year. 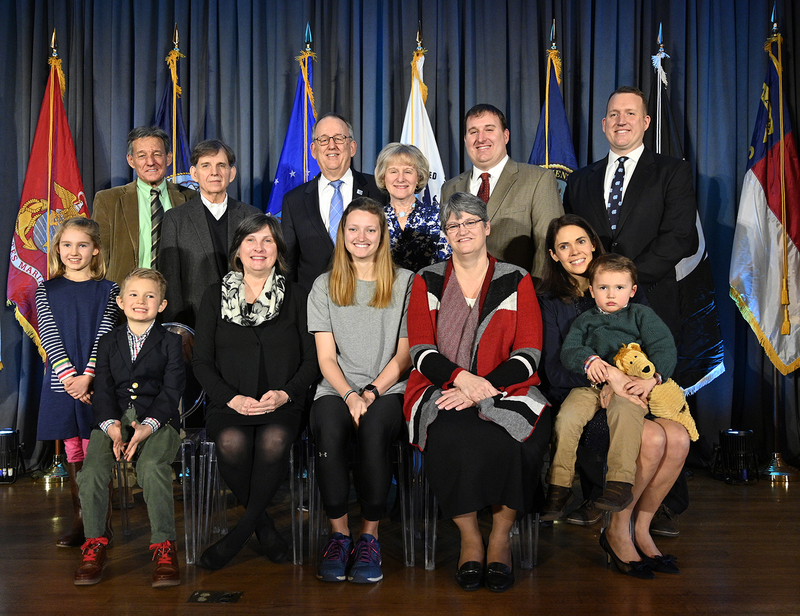 Bob Blouin, provost and executive vice chancellor, said the Dibberts’ personal story of military service and academic achievement exhibits an important underpinning for the scholarships’ expanding Carolina’s efforts toward affordability and accessibility. “I think it in many ways provides the evidence of the importance of this great gift to give an individual, a young person, a chance that they may never have had otherwise, to do something that they otherwise would never have been able to do, with just the possibility of really making a difference in this world,” Blouin said. “I don’t think that we could select a better cohort of students than those who have put their own lives on the line for this country, like your dad,” Blouin said, addressing Dibbert on stage in Alumni Hall at the alumni center. “There is no greater testament to service than the service one gives when they go into the military and they defend not only the honor of this country, but they defend the freedoms that all of us enjoy every day of our lives. 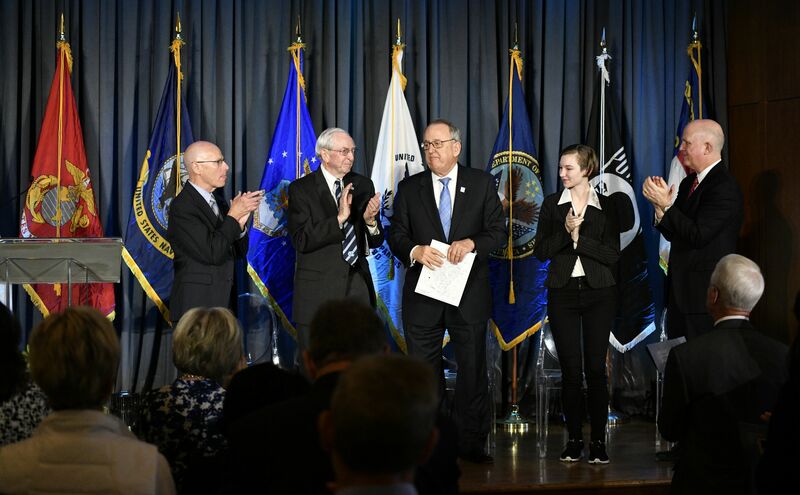 Kayleigh Olecki of Creswell, a sophomore majoring in computer science and Japanese, told the audience of more than 100 at the gift announcement that her father and grandparents had served in the military. The Carolina Covenant and the Red, White and Carolina Blue Challenge, she said, “have taken away the financial stress of today’s economy and all sorts of things and allows me to focus on what really matters, which is my studies and getting opportunities that are presented to me through UNC,” such as traveling to Japan to represent the U.S. in a program designed to build business ties. The eldest of the five sons, Doug Dibbert was a high school junior when his father was killed in action. At UNC, he was elected to Phi Beta Kappa and graduated with a degree in political science. He worked on congressional and Senate staffs in Washington, D.C., before taking the GAA leadership post. 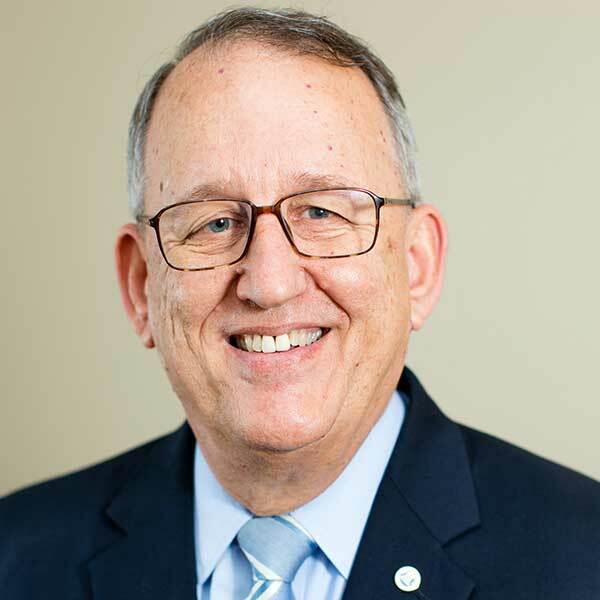 Among his professional activities, Dibbert has served on the Knight Commission on Intercollegiate Athletics, as president of the Council of Alumni Association Executives and as chair of the Council for Advancement and Support of Education. In 2015, he received the Frank L. Ashmore Award for service to CASE and the profession of alumni relations. With Dibbert’s leadership, the GAA has had a deep commitment to scholarships; as of 2017, more than $1.25 million had been distributed among more than 700 students. Carolina Clubs scholarships were established in 1994, with alumni and friends raising money to support UNC students from the area of their local club. GAA Scholars scholarships were established in 2001, with an additional donation authorized by the GAA board in 2007 for select GAA Scholars to be designated as Dibbert Scholars, honoring Dibbert’s 25th anniversary of service to the association. The J. Maryon “Spike” Saunders Scholarship was established in 1995 in honor of the late member of the class of 1925 who led the association for 43 years. Light on the Hill Society scholarships were established in 2006 by the GAA-supported Black Alumni Reunion as a tribute to Carolina’s earliest African-American graduates of the 1950s and as a vehicle to support current African-American students. Recipients of the one-time awards are selected by the society’s scholarship committee. The committee also grants renewable awards under its Julius Peppers Scholars program, made possible by $350,000 in donations from the UNC and professional football star. During Dibbert’s tenure, the GAA also has greatly expanded the scope of its services, programs and communications to inform and engage the University’s nearly 330,000 alumni. The GAA also raised more than $12 million to build the George Watts Hill Alumni Center, which opened in 1993, and donated the building to the University. Established in 1843, the GAA has a history from its earliest years of making contributions to UNC. The association led a fundraising campaign for the campus monument erected in 1858 to honor the University’s first president, Joseph Caldwell. A record-breaking fiscal year 2018 raised $617 million in commitments — marking the first time Carolina has topped $600 million in a year —exceeding fiscal year 2017’s $543.3 million by 14 percent. GAA members have been key financial supporters, contributing 83 percent of alumni donations in fiscal year 2017-18. “Thank You, Dad,” by Doug Dibbert, “Yours At Carolina,” Carolina Alumni Review, May/June 2015. “Carolina’s Edge,” by Doug Dibbert, “Yours At Carolina,” Carolina Alumni Review, January/February 2018.